These vegan sweetcorn fritters are a tasty kid-friendly treat that can be enjoyed by the young and young at heart. In a large bowl mix everything together except for the creamed corn, sweet corn and onions. 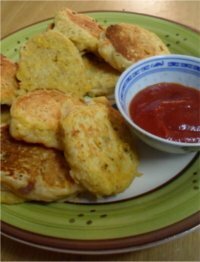 When everything is well mixed, fold in the corn and onions to make a thick batter. Heat oil in a large pan on medium heat and drop spoonfuls of batter into hot oil. When they are browned flip and cook the other side. Serve hot or cold to hungry kids with tomato sauce.